"Just to say that your firm have done a thoroughly brilliant and most professional job. I am so thrilled with the result; the floor looks so lovely, that I now don’t really want to put the furniture back into the room!" Stone polishing to produce an attractive reflective and low maintenance finish. 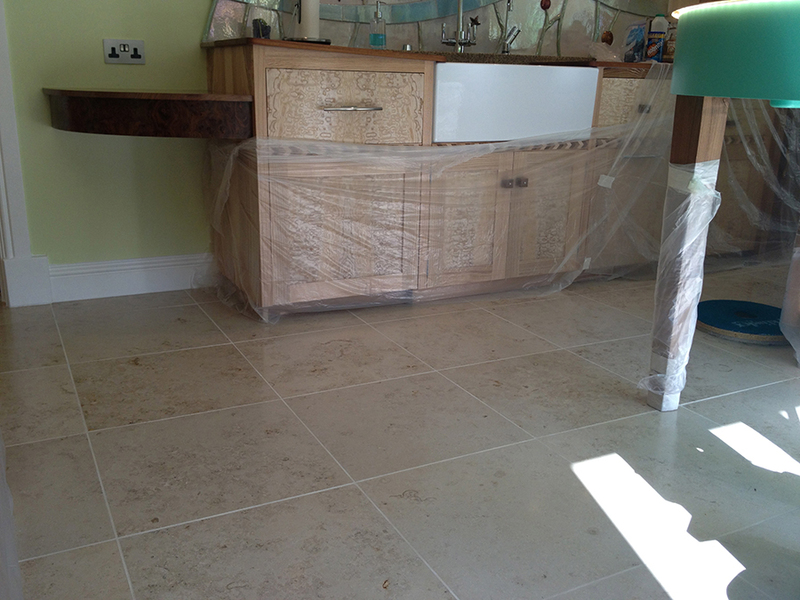 Deep cleaning of the limestone tiles to remove old seals and in ground soiling. 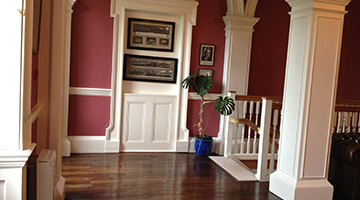 Here are just a few examples of our work – after 20 years spent restoring and refinishing floors we have accumulated a vast knowledge base and library of photographs showing the results of our work. Limestone tiles contaminated with in ground soiling and scratched; difficult to clean and staining easily; limestone grout soiled and stained. The floor was in a good condition overall but lacked the wow factor! 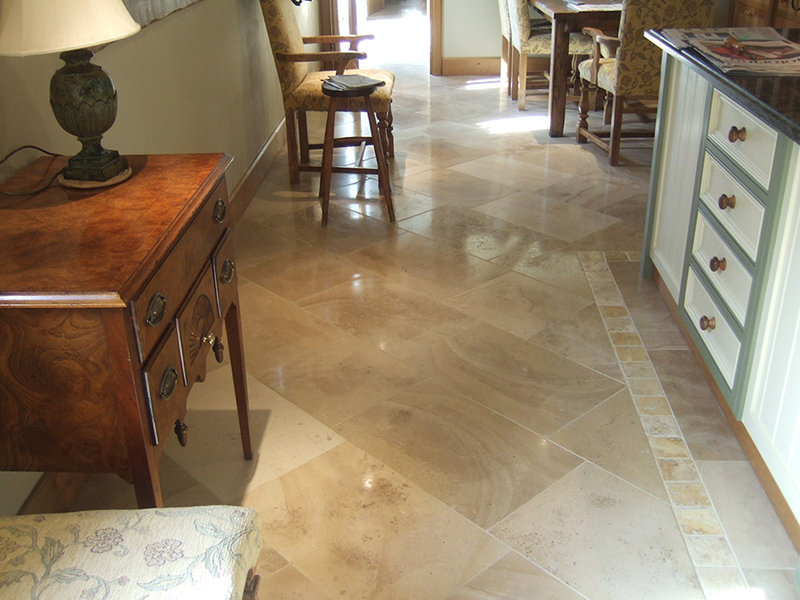 Stone polishing brought about a transformation to this elegant floor. After stone polishing the difference is quite dramatic. 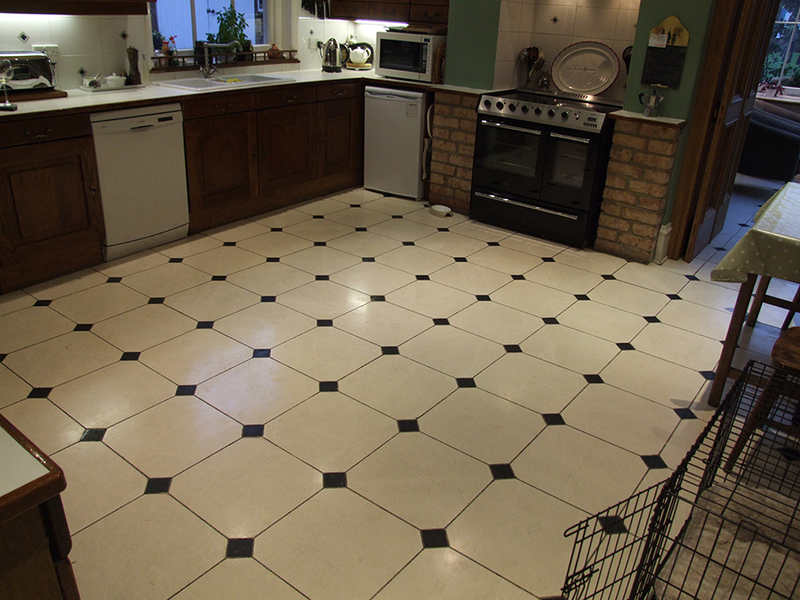 This limestone floor was left with grout and other residues from the tiling company; the floor was letting the newly fitted state of the art kitchen down and we were called upon to redeem the floor. The floor was stone polished to remove the grout haze along with glue and other contaminates and now fully complements this wonderful kitchen. 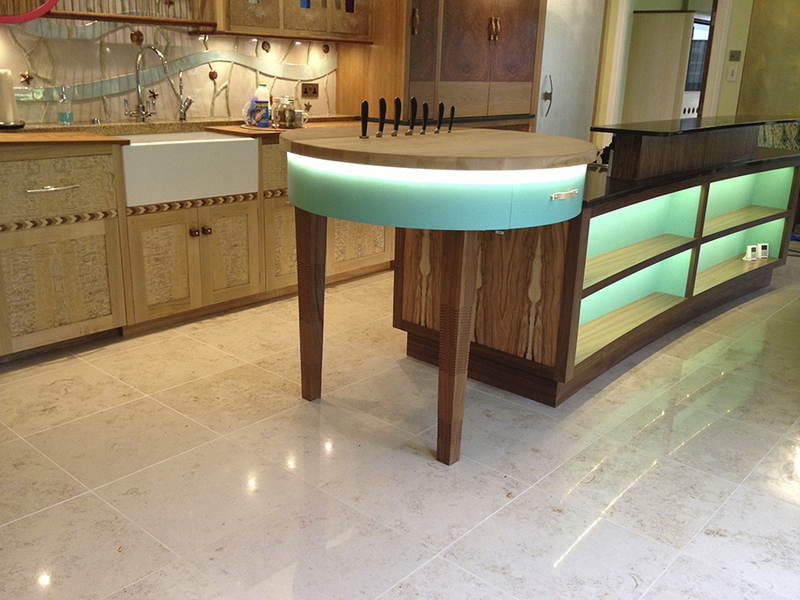 This photo shows the effect of stone /diamond polishing and sealing limestone tiles. As you can see the limestone tiles have full water repellency and the tiles are now protected against spillages, which can now be cleaned up easily. The finished floor will not attract and hold dirt and will be very easy to maintain. 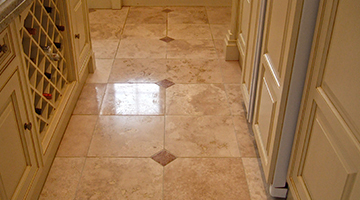 Limestone tiles attract dirt and soil easily. 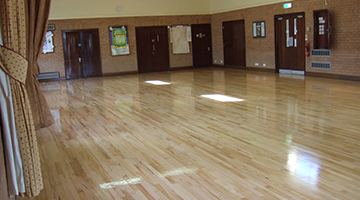 Incorrect seals /polishes applied – commonly metallized polishes- have; these types of artificial finishes attract soiling and the dirt that becomes embedded into the floor finish which then proves impossible to remove with normal cleaning; additionally these polishes also require frequent stripping and removal. Mechanically remove all traces of the old inappropriate contaminated seals. We will diamond polish the tiles leaving the tiles extremely easy to care for. 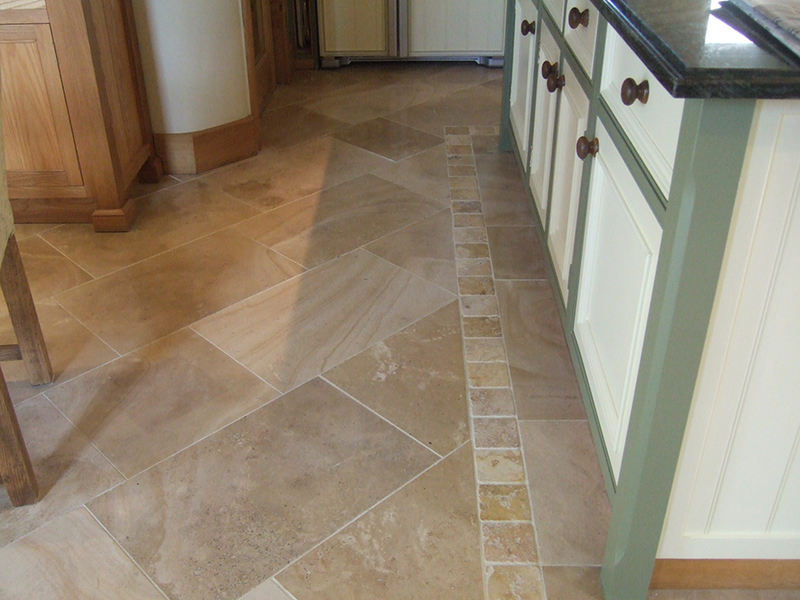 Limestone tiles are yellowing and discoloured; the finish is obscuring the natural colour and beauty of the tile. Limestone tiles are pitted and soiled. There are different forms of Limestone tiles; some have a rustic textured and pitted surface which tends to trap dirt in the holes whilst others have a smoother surface and are easier to deal with. We will treat the larger soiled holes. It should be noted that it is not possible to remove all soiling from holes especially if these are very small. 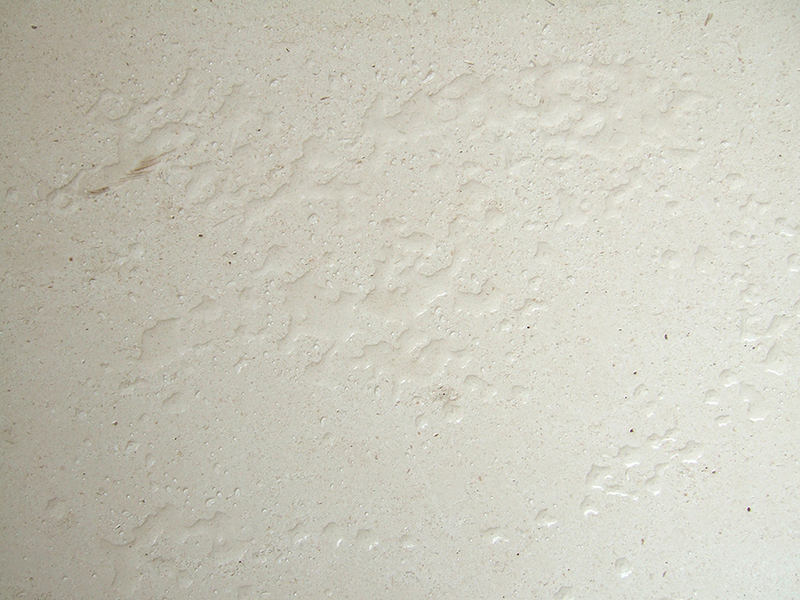 Limestone tiles are cracked or chipped. Limestone Tiles laid on incorrect adhesives – the adhesive should be flexible to allow for contraction and expansion. We will carefully remove the tile/s before replacing the tile and embedding it on a flexible adhesive and grout. Please note that if you have electrical circuit type under floor heating system fitted that there is a risk of damage to the system and that whilst we take every care in removing the tile that we are unable to accept responsibility for any damage caused to the system; that said most UFH systems are in any case repairable but you should check with your UFH company before work commences. Limestone has large holes or missing filler. We will fill any large holes using a closely matching specialist resin. 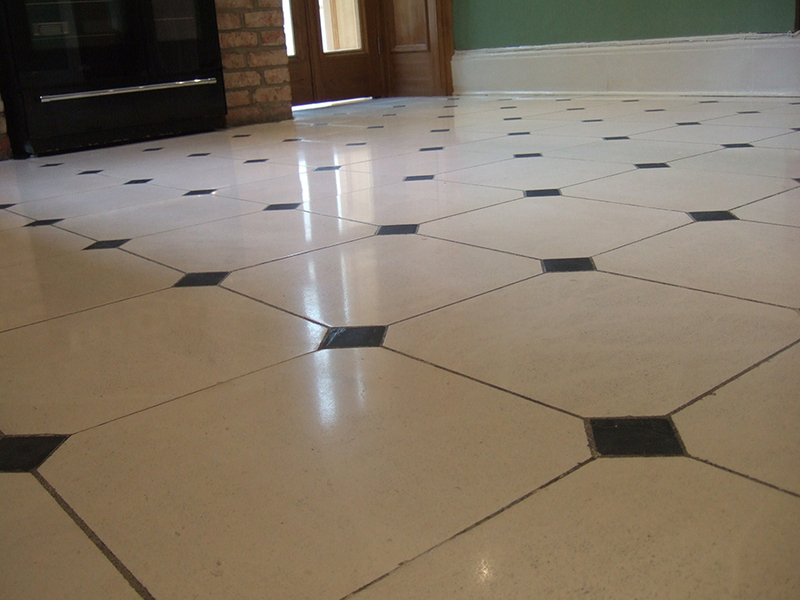 Limestone tiles grouting is discoloured or missing in areas. Missing grout will be replaced with very closely matching filler.